Natural Experiments in Product-Market Fit: How to know you don't have it. 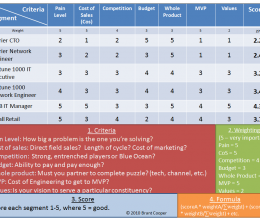 I attended the most recent Startup2Startup event and after the presentation, the discussion turned to how one might define Product-Market Fit and what might serve as a proxy for Product-Market Fit, given various types of business models. The Sean Ellis 40% rule-of-thumb was quickly invoked as were other ideas. However, I thought it worthwhile to share one insight that came from an experienced start-up entrepreneur at the table. While we were talking about triangulating on the various signals available to an entrepreneur as to what constitutes Product-Market Fit, he recounted a story -- really an accidental natural experiment -- on how he unequivocally learned his start-up hadn't achieved Product-Market Fit. To wit, his site had gone down for a few hours, and he hadn't known about it. In the interim, there had been nothing but silence. None of his users had squawked or had made it publicly known that the site was down and they were angry/frustrated/furious/going to switch providers/fed-up-with-this etc., etc. This lack of frustration/noise is a data-point. In this case, it meant his start-up had a ways to go on iterating to finding Product-Market Fit. As a contrast, we might choose to look at what happens when Twitter goes down. BTW, I believe Dave McClure has advocated a very similar idea with regard to features. If I recall correctly, he suggests removing features from a web app and waiting to hear if users complain loudly. The intensity of the complaint is likely correlated with the usefulness of the feature. In Andrew Chen’s recent post, “Does every startup need a Steve Jobs?”, he discusses IDEO’s “product framework for Desirability, Feasibility, and Viability.” Chen’s descriptions of business-, engineering-, and design-focused product perspectives reminded me of the work on companies’ “driving force” popularized by Michel Robert in his series of business strategy books. Understanding your “driving force” is critical to understanding what products to build and who to build them for. The driving force helps shape technology choices, importance of design, market segment, and business model as well as company culture, growth plan and exit strategy. The basic point, is that while all companies employ technology, sell products or services, employ technology, market to specific segments and use certain distribution methods, one factor dominates (or should dominate) the others in terms of business strategy. Everyone has heard of the "elevator pitch" and all entrepreneurs know they need one. Right? I'm talking about the ability to tell your business story in the time it takes the elevator to get the floor where your audience will egress. While everyone knows they need one, the confidence imbued in entrepreneurs -- necessary to be an entrepreneur -- often results in the overconfident belief that the pitch will magically flow when the time comes. I've been working in technology for a pretty long time, having weaved my way along an illuminating path through development, IT, project management, product management, product marketing, marketing and executive leadership. Two epochal moments happened in my career at one company, Tumbleweed (now part of Axway), that helped me consciously acknowledge these two principles. I learned from CFO Joe Consul that what I had been doing for years was actually called project management. (Yes, some of us are slower than others.) I was able to structure and formalize what I was doing, which allowed me to become more efficient, teach others, scale, etc. I learned from marketing that although I was an IT Manager, my views on how to sell to IT Managers (our target market), was not necessary. Tumbleweed was an interesting ride; it reached the highs and suffered the lows that all businesses that last 10+ years endure. A lot of mistakes were made, and a lot of lessons learned. There were many success stories, too, and, unsurprisingly, lessons learned there, too. I saw evidence of certain elements of Geoffrey Moore's Chasm, as well as in retrospect, a lack of customer development. Not to fault anyone, but the late 90s saw a lot of customer defumblement. Steve Blank's presentation of Customer Development is persuasive. Eric Ries' Lean Startup, combining customer development and agile development principles is even elegant. Whether internal or external, formally defined or not, no matter what you are doing, you have a customer. Whether explicitly defined or not, you also have at least one objective associated with your customer, e.g., make them happy, accept their money, increase their market share. To reach objectives, you must execute on a carefully-crafted plan; a carefully-crafted plan that you must defenestrate the moment you conclude it doesn't work. Hopefully your plan includes post-defenestration steps. Steve Blank @ startup2startup joked that, to put it mildly, The Four Steps to the Epiphany, is a difficult read. But customer development isn't hard because Blank's book is difficult to read. Customer development is hard because the answers to the questions that will test your assumptions are difficult to come by. As any project manager who has ever had to "gather requirements" knows, customers don't know what they don't know. The customer is not always right, but they do have the last word. It's your job to empower and persuade customers to act in a way that achieves your objectives for them. But how do you know how to get them to act? You can guess. You can hard sell. You can ask. You can lie. You never actually located your customer. Your objectives for the customer were not clear. Your tactics for achieving the objectives did not match the customer's behavior. Your process for "listening" to the customer was wrong or incomplete. A disciplined approach for web-based products allows for faster learning, but for "offline" products, customer development is a particularly meticulous and time-consuming process. Basing conclusions on personal narratives. I'm sure there are more; feel free to share in comments.